Chadwick Boseman is a name you will soon hear often. In addition to starring in The Kill Hole, Boseman has been cast as the lead role in the upcoming Jackie Robinson biopic, 42, alongside Harrison Ford, a part he jokingly said he “sold his firstborn child” to get. 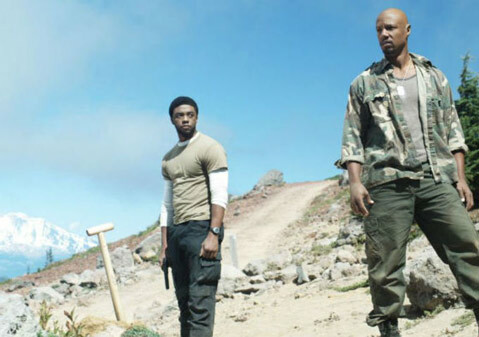 Boseman — who is also a director and writer — says that The Kill Hole “raises the age-old question: when is the time to kill?” In the film he plays Lt. Samuel Drake, a troubled veteran and military contractor returned from Iraq. When the security firm Drake worked for tracks him down and gives him a new assignment — to find and kill Sgt. Devin Carter, a Marine Corps sniper gone AWOL in the Pacific Northwest — Drake is forced to confront his violent past. The Independent spoke to Boseman about his experiences and what he draws on as an actor and a writer. Tell me about your character in The Kill Hole. Who is he? Samuel Drake’s war is within himself. He’s torn between the pride of being a marine and the shame and guilt for his actions as a mercenary. He is a man who doesn’t feel worthy of happiness and normal life. My approach was to figure out who he was before the war. What did he leave behind? What and who is he still trying to get back to? In my mind he had a family that he would return to if he could just get himself together. That is not explicit in the script, but it’s necessary to give him something to fight for. What did you draw on for your performance? When you have time, I think you have to always seek primary resources. We didn’t have as much time as I wanted, but I did what I could to talk to soldiers. We also worked with actual vets in the support group scenes. Those scenes were the heart of the movie. They were real sessions. Real soldiers reached real breakthroughs during that experience, largely because they were so interested in contributing to the theatrical process, and because Billy Zane, who is also a director and writer, uses his role to implement a sort of psycho-dramatic therapy session that the soldiers were extremely receptive to. Afterwards some of them said that it was the most effective support group session they had ever had. For me, speaking during those real sessions as a character at first felt disrespectful and dishonest. They were telling real stories. I had a script to fulfill. But the weird thing is that they felt dishonest as “actors” because well they weren’t. So we were kind of in the same boat. So what do you do but stop acting. I used the fact that I actually was an outsider to tap into Drake’s guilt about being a bought soldier amongst real soldiers and they just forgot that Billy and I were actors. What I got a sense of was the great camaraderie that exists between soldiers. There is an intimacy and sensitivity there that contrasts the stereotypical vibrato that soldiers are often given. We shot all those support group scenes that first week, and I just carried that with me for the rest of the film. This is your first major role in a feature film. How do you like being in a film as opposed to doing television? I’m not really thinking about the end result that much. The end result is seeing it on the big screen. I like the process of making a film more than I like the process of making television. In television you don’t have a lot of time to spend with the role or the script. Typically you get a script a week prior to shooting. Sometimes it’s even less time, not enough time to dream about the role. You’re cramming an entire episode into eight to ten days as opposed to shooting one story for two months. It’s the microwave version of filmmaking. However, I’ve been blessed to work with a lot of people in television that work in film and they seemed to find moments to bring their film process to the television set. How are you preparing for your upcoming role as Jackie Robinson? Before I left New York earlier this month, I made it a point to talk to Rachel Robinson, Jackie Robinson’s widow. We exchanged info. She told me to call her with any questions. She is an amazing woman. I’m not just saying this to sound cute. It’s like meeting royalty, the president, a queen. She carries the glory of their victories on her. It was important to me to meet his better half to understand him. I also went to places that I think he would have gone. There’s a spot, Tom’s Diner on Washington Avenue in Brooklyn. It’s been there since 1936, and Washington leads you right to where Ebbets Field used to be. I went to Tom’s thinking he might have gone there before. Tom’s prides itself on maintaining some of the old school ambiance. I go inside and I just start talking about the old Dodgers and the manager says, “Worst thing that ever happened to Brooklyn, the Dodgers leaving.” Then he says, “You know Jackie Robinson? His wife was in here two weeks ago, sitting right there,” he points to a booth with his finger, “with a senator or something.” So my hunch was right. She obviously didn’t invite a senator to eat at a diner that’s been there since 1936 unless it has some historical significance to her. I’m sort of an experiential detective. You spend time making yourself available to experiences that will mean something to you when the cameras are rolling. From Tom’s I walked across Eastern Parkway for six minutes to where Ebbets Field used to be and where the Jackie Robinson Apartments now stand. I talked to an old man who remembered picking up baseballs outside the stadium when he was a kid. And so I see that the ghost of the old days remains in Brooklyn. I closed my eyes and listened to the city right there for a moment. I have all the autobiographies and the films and the footage and that’s part of it too, but I like visceral experiences also. Of course I’m playing baseball. Five days a week from 10 to 3, running bases, taking ground balls, batting practice, conditioning, etc. I’m playing Jackie Robinson. I have to be able to steal home. But there’s a lot to the man beyond baseball. Those are the parts that excite me the most. You’re also a playwright and screenwriter. Is that something you’d like to gravitate toward, or would you rather focus on acting? I started out as a writer and a director. I started acting because I wanted to know how to relate to the actors. When people ask me what I do, I don’t really say that I’m an actor, because actors often wait for someone to give them roles. I’m an artist. Artists don’t need permission to work. Regardless of whether I’m acting or not, I write. I write when I’m tired in fact, because I believe your most pure thoughts surface. Between my first and second meeting for 42 I directed a workshop production of a new play for the hip-hop theater festival. I returned to LA during the week of our final talks and directed a short film written by Javon Johnson. I’m an artist. I take the job that fits my inspiration and is best for the project. What are some of your inspirations, writing-wise? Music. I love all types of music. Jazz, classical, blues, rock, hip-hop. I often write scripts to instrumentals like a hip-hop artist. Music inspires me to write. It’s either music playing or completely silent. Sometimes distant sound fuels you. In NY there’s always a buzzing beneath you. If you mean my favorite writers: James Baldwin, Bob Dylan, Khalil Gibran, Jay Electronica, Woody Allen, Talib Kweli, David Mamet, August Wilson. But writers don’t inspire me to write, the music in every day life does. Your play, Deep Azure, played in Chicago in 2005. Can you talk about that? Can you also tell me about some of your other plays and screenplays? Actually Deep Azure was recently published in a theater anthology entitled “Say Word.” That play was the product of a theater movement called Hip Hop Theater that I was blessed to be part of and one of many innovators in. A group of us were using the aesthetics of hip-hop in theatrical performance. Although the musicality of these pieces produced their own emotional framework and the ability to play intensions, I wanted to see if you could use the hip-hop aesthetic outside the beat in order to allow the actor the room to invest more fully in moments. The language became an amalgamation of pop, hip-hop, blues, and jazz slang that sounded like Shakespeare to most people when they heard it. That was not my intent. It’s really just a drama with heightened speech. We work-shopped it at the Apollo Theater Soundstage and then put a full production up at Congo Square in Chicago. Derrick Sanders directed it. It was nominated for a Jeff — that’s like Chicago’s Tony Awards. After winning a screenplay competition for a script called End Zone, my writing partner, Logan Coles, and I started taking meetings with production companies at some of the major studios. They loved us as writers, but they didn’t feel like they could make money on that script at that time. We were passed some of the ideas they were developing. We weren’t really interested in writing any of those projects. Since then we did a rewrite of End Zone and renamed the script Audible. It’s the type of football movie that chicks would like too, and not just football chicks, because there are a lot of women who love the game, but women in general seem to really love the script. With the rewrite and a better title in a better time I think we’ll get it done. The Kill Hole screens on Saturday, January 28, 11:00 a.m. at the Metro 4, on Monday, January 30, 7:00 p.m. at Metro 1, and on Saturday, February 4, 5:00 p.m. at Metro 4.